Howdy from Niseko! Niseko is on the north island of Japan, and it is renowned for its world class skiing. We saved this resort for the end of the trip so that everything would build up to this final location. We are near the end of our two weeks here and the skiing has been incredible. We ski almost every morning before having classes in the afternoon and early evening. After 4 weeks of cloudiness (although I can't complain, it also brought piles of snow), we have been greeted with blue bird skies every morning in Niseko. The ski mountain, Grand Hirafu, overlooks a massive volcanic mountain called Mt. Yohtei. It's so impressive that it is regularly pictured in advertisements about skiing in Japan. I frequently find myself staring at it in a daydream when I take a break from skiing or am riding up the single chair. Grand Hirafu has a vast amount of back country skiing, and there is a continual line of people hiking up to the top of the mountain to hit the fresh powder. 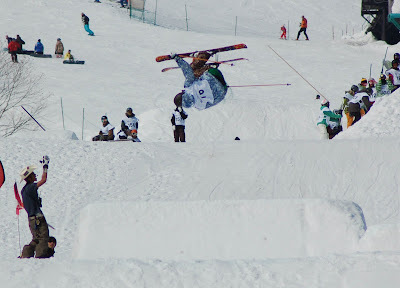 The mountain also hosts a number of national and international events throughout the year, and we took in an aerial competition this weekend. Check out the crazy announcer in the cowboy hat on the left in the second picture. 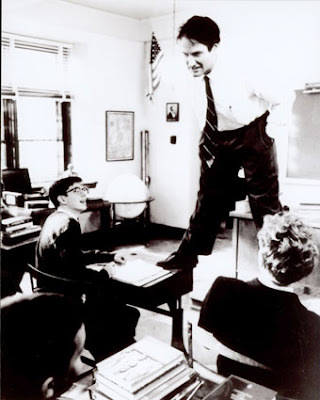 Finally, on the academic side, we've been watching Dead Poets' Society in English class and relating it to Lord of the Flies. 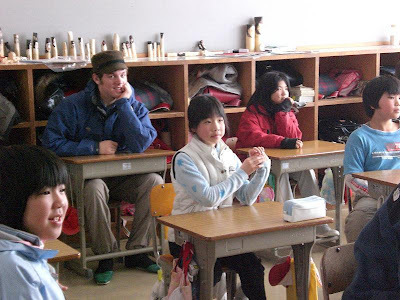 It's a great way to end our time in Japan before spring break, and it gives me a chance to post a picture of a real teacher. On our way to the airport to catch a flight to Hokkaido, the north island of Japan, we got to spend a day in Tokyo! We spent the day walking to as many destinations as we could. Once we hit the streets, one of the first things we noticed was the frequency of bikes in the city. It seemed like half the people were biking instead of walking! The sidewalks are made extra wide to give space to both bikers and walkers. Because of all the traffic, many of the people in Tokyo choose to ride on their bikes instead of in their cars. After a little bit of walking, we found the largest open air marketplace in Tokyo. Everywhere you looked people crammed into every opening and alley. The crowds were so bad that you could barely make progress towards your destination. At one point I climbed onto a monument just to get a break from the crowd. If you look closely, you can see that the sea of people seems to extend down the alley into infinity. As we slowly worked our way through the marketplace, we were entering the heart of Tokyo. Massive electronic billboards and signs covered most of the buildings. The crosswalks were overflowing with people. We kept pushing through the crowds to get to the centerpiece of Tokyo: The Imperial Palace and Gardens. The grounds of the Imperial Palace and Gardens are said to be the most expensive land in the world. It is only 1.3 square miles, but at the height of Japanese real estate boom in the late 1980s it was worth the same as the entire state of California. Most of the grounds are off limit to tourists, but there are a few areas you can visit. After the Imperial Grounds, we made our way into the most congested region of Tokyo. It's so crowded, that it is home to the busiest intersection in the world. And here I am in the middle of it (the tiny man in red with his arms wide open)! The long walk through Tokyo ended when we hopped onto the subway and made our way back to our hostel. Greg, with his sunglasses on, stood out in the Japanese crowd. To complete the day, we visited a few different shrines and temples that evening. Not a bad way to spend a Saturday! 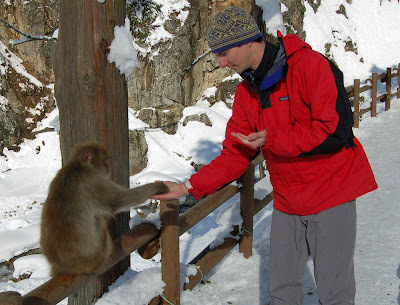 Today we went to a snow monkey preserve. We had to take a bus for an hour and then hike 20 minutes into the woods just to get there. Once we arrived, the effort was well worth it. There were snow monkeys everywhere! The animals congregate in this valley because of its protected location between steep cliffs. The area also has a large food supply, fresh water, and even an onsen! The area is a natural habitat for the monkeys and there aren't any fences to keep them contained. A lot of tourists visit them though, so it is obvious that the monkeys have become desensitized to humans. They were completely oblivious to all the people. Greg was able to get right next to them at the onsen to take a picture. The monkeys were feeling quite photogenic, and I was able to get a couple of pictures of them cleaning each other and hanging out on a fence. I even got one of the babies to come out of the water for a picture! Nick, one of the AGE students, spent his time quietly observing one of the monkeys alone. After a few minutes, he realized that it was digging into the snow for seeds that had fallen from the trees. Nick quickly decided to climb into the snow and join the monkey in its search. When Nick found seeds, he would put them into his hand and gently open his palm towards the monkey. As the monkey reached for the seed, a moment of two conflicting worlds in beautiful harmony prevailed. Not one to miss out on the experience, I quickly climbed into the snow bank with Nick and started digging. After I collected a number of seeds, I found a new friend to share them. After visiting the monkeys, the day trip was complete with a stop to the most popular onsen in Japan. Despite its popularity, I was able to have it all to myself during the lull of a Thursday afternoon. One look let's you know why it is Japan's favorite. We have been skiing about every third day in Nozawa Onsen. There is a lot to do in the town, so we have spent more time doing different cultural activities than skiing. Still, here's a picture from yesterday. As one of our cultural activities, today we had a local expert in calligraphy come to the lodge to teach us how to write Japanese characters. As if the characters aren't hard enough, it turns out that proper Japanese calligraphy has to be completed in a certain order with just the right pressure and timing. More pressure results in wider marks, while slower movements (which sometimes involves blotting) result in a thicker layer of ink. One example is in the word "dream." "Dream" is two characters. The one on the left is my pathetic attempt and the one on the right was made by our calligraphy teacher. As you might have noticed, parts of her strokes barely appear. That's not sloppiness; it's perfection. The characters are supposed to be written that way. What seemed difficult at first now seems impossible! Still, we continued to ask her to write a few of our favorite words for us to try to duplicate. Here is "nature." The one on the left is hers, the one on the right is mine. Finally, I realized the one word I really wanted to learn how to write: spirit. The one on top is hers, the one on the bottom is mine. In Japanese, you pronounce it "tama-she." Today we had an incredible experience attending a few different classes at the Nozawa Onsen Elementary School. We went to participate in some of their lessons and to teach the students a little bit about us. It was mostly an excuse to have some fun and play games with the kids. The first class we went to was a sixth grade class. They sang to us a couple of songs and then we played card games with them. I still don't know how the game works, but I'm pretty sure I was in the lead for a while! We also played a game of "rock, paper, scissors" to decide who would draw first. I guess the really important games are known throughout the world! We next went to a science class. The students were doing a fun lab that involved using very cold salt water to make fresh water freeze. Joey worked hard to ensure that his group did the best. If you look closely at the picture, you'll notice that the boy in red is actually wearing a Boston Red Sox shirt! I was so excited that I started rattling off all the Japanese players who have played for the Sox: "Dice-K Matsuzaka? Hideki Okajima? Tomokazi Oh-ka!" The boy just blankly stared at me with a tinge of horror on his face and then ran away. I guess that while most students wear clothing with English writing, they rarely know what it means. Oh well. Before class ended, Tom challenged one of the students to an arm wrestling match. Tom claims that he let him win. We still sent him to the back of the class for letting things deteriorate so much. The last class we attended was physical education. We started the class with a powerpoint presentation about ourselves. And then we taught them a few different games we play in the United States. Here's one of the Japanese students playing Duck-Duck-Goose. Even though our time in classes had ended, we saved the best for last. We stayed at the school a little longer so we could eat lunch with the students. 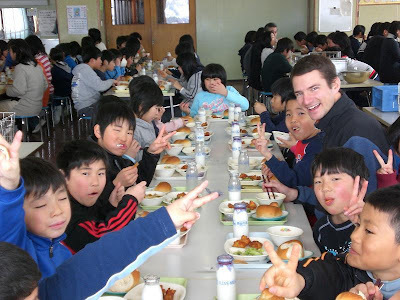 We were each seated separately at different tables in the lunch room and served a standard Japanese school lunch. It consisted of fried tofu nuggets, seaweed soup, salad, bread with marmalade, and milk. The most interesting portion of the meal was the salad. It seemed like a pretty normal salad until you noticed that the things that looked like bean sprouts were actually tiny, whole fish. We had read that it is rude to not finish your entire meal, so I had only one option. Over the lips, past the gums, look out stomach, here she comes! During lunch I tried communicating with the students but it was difficult since they know about ten words in English and I know even less in Japanese. It ended up becoming a game of charades to try to explain that I liked baseball and basketball (I couldn't think of the motion for sailing). I felt like Kevin Costner in "Dances with Wolves." "Tatonka! Tatonka!" As I sat there at lunch taking it all in, I was overwhelmed by the experience. I realized that I would never again be in this situation and that I would enjoy it while I could. As Jack London said, "I shall not waste my days trying to prolong them. I shall use my time." Nozawa Onsen is known as the birthplace of skiing in Japan, so it hosts a museum about the history of skiing in Japan. We visited the museum this morning. It's actually part of the way up the ski mountain! They had all sorts of memorabilia from different time periods and types of skiing. The coolest exhibit in the museum was the one about the Olympics, which included a feature about the 1998 Nagano Olympics. Here are the Olympic medals from 1998. Nagano also hosted the paralympic games in 1998, and had a section for that as well. Yes, that's mutton, entrails, beef, horse tongue, and pig tongue. One of the students went for the beef, while the other one went for the mutton and horse tongue. 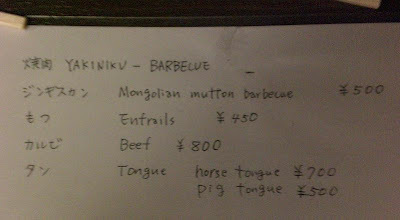 However, he only got the horse tongue under the stipulation that we all tried it. They brought the raw meat out for us to cook at our table. Here's a picture of a cooked piece of horse tongue with all the raw pieces waiting to be cooked. And here I am about to try my first piece of horse tongue! I had two pieces. The first was to try it. The second was to go the whole hog.